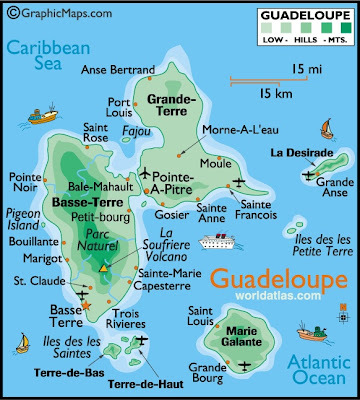 If you're not familiar with the island of Guadeloupe, it is an overseas department of France - one of the twenty-six regions of France, and part of the European Union. 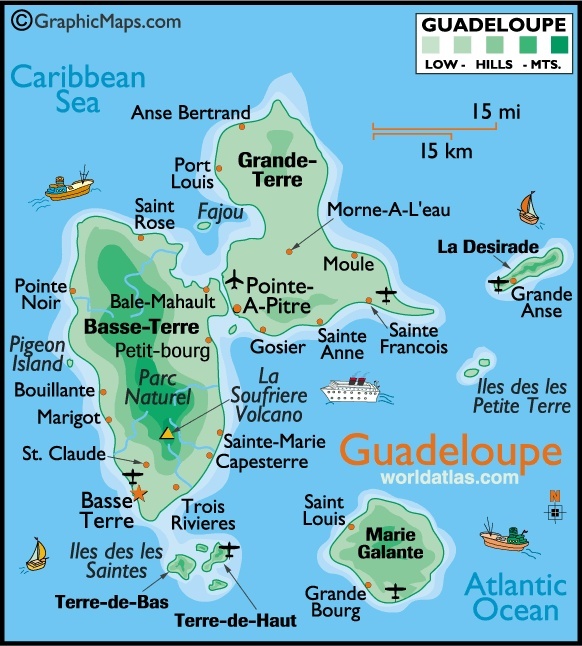 Called the "Island of Beautiful Waters" Guadeloupe is actually comprised of five islands, and is often described as the butterfly shaped island. The adjacent islands are La Desirade, Les Saintes and Marie-Galante. In fact, wherever you go on the mainland or island chain, you are never far from a beach. Dream destination for island hoppers and beach lovers! Basse-Terre and Grande-Terre are separated by a narrow channel called the Salt River. Grand Terre is flat with beautiful white sand beaches and spectacular scenery. Basse-Terre is mountainous with the volcanic peaks of La Soufriere, and Parc National rainforest with hundreds of orchids, trees and birds. La Soufriere, an active volcano, rises 4,813 feet above Basse-Terre. Having already visited the French Caribbean islands of St Barths, Martinique, and St Martin, I found Guadeloupe to be a rather unpretentious French experience with an emphasis on food, music, dancing and beautiful beaches. Not many American's have Guadeloupe on their bucket list, and tourism is NOT the major focus - these factors alone were enough to put the island in my sights. The opportunity to visit came when vacationing with friends in Dutch St Maarten, which offers easy access to Guadeloupe by ferry. My original plan was to take a few day trips. However a better opportunity came into play at lunch when I met a couple from France looking for directions. During our conversation, I mentioned wanting to visit Guadeloupe, and they happened to be friends with an apartment owner on the island. We exchanged numbers, and within a few days I was off to Guadeloupe - not for a day trip, but an entire week! Lacking fluency in the French language was not going to deter me as I had my trusty translator. The apartment owner sent a driver to pick me up from the ferry. As he took my bags and led me to the car, I greeted him with my best accented greeting - "Je m'appelle Enchanté Linda" - my name is Linda, nice to meet you. After a little conversation, the driver obviously gathered my French was limited to the basics, and he stopped talking and turned up the radio on full blast. The local Zouk music made me feel somewhat at home as it reminded me of New Orleans Cajun Country. Music always breaks down barriers, and is a universal language. We both were quite content as we "car danced" for the rest of the ride. The price quoted for the apartment was just $90.00 per night, and that included breakfast and dinner. Traveling by myself on the cheap was more of a concern than the language barrier, and I was fully prepared to change accommodations if needed. To my surprise the apartment was more than adequate - very clean, spacious, and in a great location in Gosier. That night the owner fixed a wonderful grilled fish in a spicy creole broth, creamed dasheen (green vegetable), fresh baguettes, a tasty fruit salad, and the local Ti Punch. Before heading to bed I sent an e-mail thanking the French couple for setting me up, and another to my family letting them know the vacation was off to a great start. The next day it was off to the ferry for a day trip to the big round pancake island of Marie Galante. 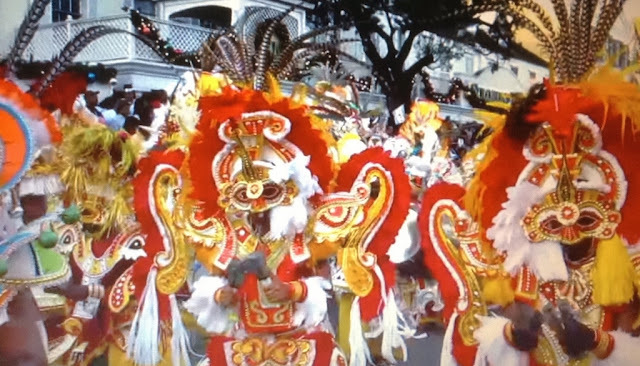 Marie Galante is like stepping back in time. It's a fishing and farming community, and has remained very rural. You won't find any tourist development here, just natural beauty and picture postcard beaches. The plan was to cover as much of the beach coastline as possible, have lunch, and pick up a couple of bottles of the island's infamous Father Labat's Rum. As I set out on foot an older gentleman waved as he passed by in an old rickety cart filled with straw pulled by a huge multi-colored oxen. He slowed down, offered me a ride, dropped me off on a perfect beach path, and also pointed the way to a great little lunch spot. After eating I picked up several bottles of rum at a little shop, and made by way back to the ferry. Perfect beach day, along with my first ride on an ox driven cart! Soft golden sand beaches with crystal clear water, lined with coconut and raisin trees. It was hard to believe most of these awesome beaches were deserted - pure paradise! Jacques Cousteau named the waters off Guadeloupe as one of the top 10 diving spots in the world. Day 3 - Took advantage of the bike offered by the apartment complex, and rode around the island with no care of getting lost. Vivid color is everywhere - reds, deep blues, yellow and green flowers, plants and tropical birds. I rode pass fields of vanilla, bananas, cocoa plantations, and purchased fresh grown coffee, cinnamon, juicy papayas, and tomatoes at the local markets. Getting into the female Creole vibe, I tied a traditional madras turban around my head, and eventually found my way back to the apartment. On the dinner menu that night, Creole stuffed crabs - magnifique!! Day 4 - Time to rent a car for the rest of the stay. The roads are quite good, and thank goodness driving is on the RIGHT side of the road. The rental was fairly inexpensive, however the price of gas was downright outrageous. Historical monument built in 1650. Louis Delgrès committed suicide in 1802 rather than be subjugated to the restoration of slavery. With African, French, Indian and Caribbean influences, dining on the island was everything I anticipated and more. I over indulged in fresh lobster, crab and fish all cooked in delicious creole sauces, along with fresh vegetables, fruits, and sorbet cranked out by hand. Seriously if I had done nothing else but eat, the trip would have been worthwhile. The island of beautiful waters has tons of waterfalls - quite like Dominica and Jamaica. The sounds of "zouk" and Gwo ka la base can always be heard throughout the island. There are lots of night clubs and bars, and the main tourist areas are always open. Many of the local bars outside the tourist areas are closed during the work week as the locals tend to go to bed early, however they are ready to party on the weekend. The French Caribbean can be a bit pretentious, especially if you are not fluent in the language. What I found was more of a laid back friendly Creole Caribbean vibe, with a definite French style. I would recommend Guadeloupe for those who like destinations off the beaten path, beach sand in all colors, hiking, diving, island hopping, excellent french and creole cuisine, and somewhere you can break out in dance anywhere, any time of the day or night. Getting to Guadeloupe is getting easier for travelers from the U.S. American Airlines started a weekly non-stop flight to Pointe-a-Pitre from Miami.